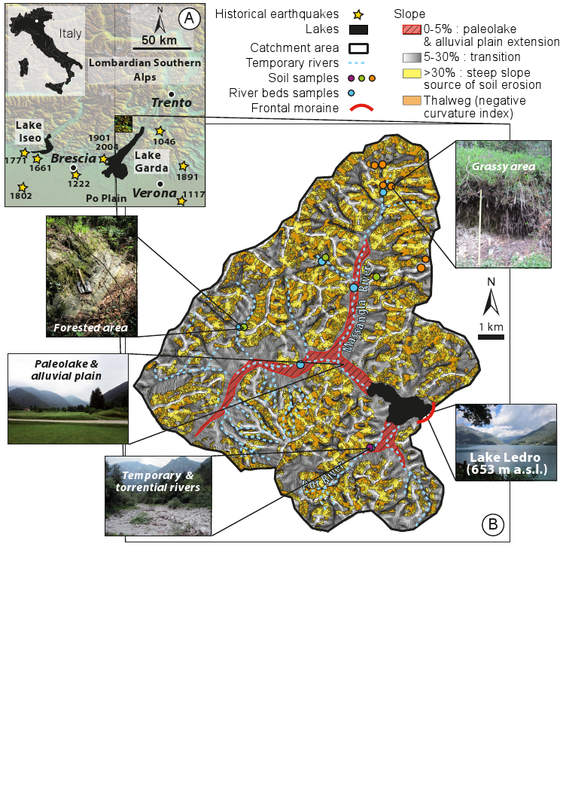 Abstract : High-resolution seismic profiles and sediment cores from Lake Ledro combined with soil and riverbed samples from the lake's catchment area are used to assess the recurrence of natural hazards (earthquakes and flood events) in the southern Italian Alps during the Holocene. Two welldeveloped deltas and a flat central basin are identified on seismic profiles in Lake Ledro. Lake sediments have been finely laminated in the basin since 9000 cal. yr BP and frequently interrupted by two types of sedimentary events (SEs): lightcoloured massive layers and dark-coloured graded beds. Optical analysis (quantitative organic petrography) of the organic matter present in soil, riverbed and lacustrine samples together with lake sediment bulk density and grainsize analysis illustrate that light-coloured layers consist of a mixture of lacustrine sediments and mainly contain algal particles similar to the ones observed in background sediments. Light-coloured layers thicker than 1.5 cm in the main basin of Lake Ledro are synchronous to numerous coeval mass-wasting deposits remoulding the slopes of the basin. They are interpreted as subaquatic mass-movements triggered by historical and pre-historical regional earthquakes dated to AD2005, AD1891, AD1045 and 1260, 2545, 2595, 3350, 3815, 4740, 7190, 9185 and 11 495 cal. yr BP. Darkcoloured SEs develop high-amplitude reflections in front of the deltas and in the deep central basin. These beds are mainly made of terrestrial organic matter (soils and lignocellulosic debris) and are interpreted as resulting from intense hyperpycnal flood event. Mapping and quantifying the amount of soil material accumulated in the Holocene hyperpycnal flood deposits of the sequence allow estimating that the equivalent soil thickness eroded over the catchment area reached up to 5mm during the largest Holocene flood events. Such significant soil erosion is interpreted as resulting from the combination of heavy rainfall and snowmelt. The recurrence of flash flood events during the Holocene was, however, not high enough to affect pedogenesis processes and highlight several wet regional periods during the Holocene. The Holocene period is divided into four phases of environmental evolution. Over the first half of the Holocene, a progressive stabilization of the soils present through the catchment of Lake Ledro was associated with a progressive reforestation of the area and only interrupted during the wet 8.2 event when the soil destabilization was particularly important. Lower soil erosion was recorded during the mid-Holocene climatic optimum (8000-4200 cal. yr BP) and associated with higher algal production. Between 4200 and 3100 cal. yr BP, both wetter climate and human activities within the drainage basin drastically increased soil erosion rates. Finally, from 3100 cal. yr BP to the present-day, data suggest increasing and changing human land use.